Rwanda seems to invoke an irresistible feeling to first time visitors many of whom have ended up extending their stay or leaving to return for permanent stay. In 2009, the Egyptian government sent to Rwanda two of its specialised obstetrician gynecologists to deepen collaboration between the two countries. 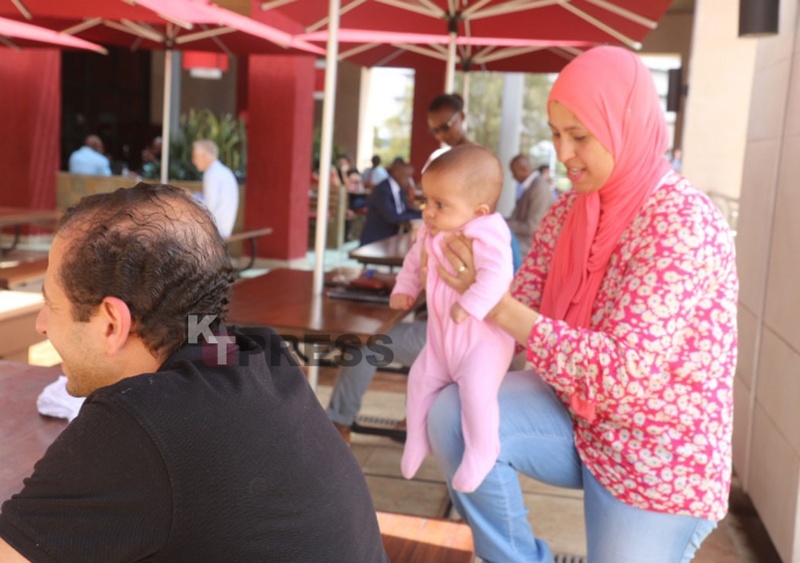 Dr. Hebatallah Salama 40 and Dr. Mohamed Okasha packed their bags and flew from Cairo to Rwanda to help expectant mothers to deliver safely at various hospitals. However, since 2009, this married couple didn’t return to Egypt even after completing their mission. They decided to stay. The couple has a very busy schedule, but is available every Wednesday and rarely on Sunday. All other days, they are busy handling cases of expectant mothers. And for almost week-long exchange of text messages and phone calls, KT Press linked up with the couple for a two-hour conversation. 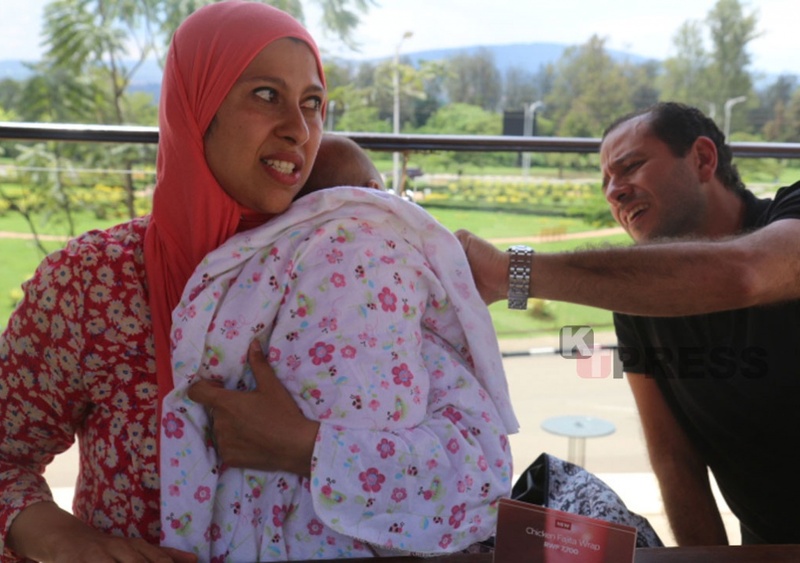 “Rwanda has become our other home,” says Dr. Mohamed – seated next her wife standing as she calms down their crying four-month old daughter. Dr. Heba (as she is fondly known to her patients) told KTPress, “We rarely eat lunch due to so many patients we attend to. As a result we joke about it that every day is Ramadhan (the Muslim fasting month),” she said amidst laughter. Since 2009, Dr. Heba has been attending to an average of 40 expectant mothers daily, while her husband handles 30 cases daily. This means that on average, the two have attended to at least 153,000 women in a period of 7 years. “This profession is beyond just a job, it is a responsibility,” Dr. Mohamed told KTPress. But who is Dr. Mohamed? He was born and raised in Cairo and studied at one of Africa’s oldest Universities – Cairo University, where he obtained a medical degree. He graduated in 2002. He studied a master’s degree at Ain shams University in Cairo. “Taking care of patients is something that every doctor should do wholeheartedly. When a doctor is attending to a patient, you do it like you are treating a member of your family,” says the father of two. Dr. Mohamed finds what he is doing not special – given his competence throughout his entire medical career. Instead, “This is what I am supposed to be doing. This is how I saw my teachers working. They could put off their biggest level managerial posts and come down to patients and take good care of them,” he said. The couple has a four-month old daughter following their 8-year-old son. But what disturbs both of them is having ‘very’ little time for their son. “My son calls me every day before he goes to bed and asks if he will see me before he falls asleep. The lifestyle of a doctor is not an easy one,” Dr. Mohamed says. Both Dr. Mohamed and his wife Heba usually arrive home past mid night when their son is already asleep. “I always fight to get some little time to look after my children and fitness sports but it is not easy. In fact I can leave you right now in case I receive a phone call to attend to patients,” Dr. Mohamed jokingly said. Heba and Mohamed have canceled countless appointments to visit friends. In fact, they have abandoned assuring friends of anything. Even visiting their home country has become a challenge. For the past 2 years, the two have not visited Egypt to meet their families. “I only make phone calls to hear from my mother. Unfortunately my father died two years ago,” says Dr. Mohamed. Both did not meet while at medical schools in Cairo. They only met while working and both of them were ‘very astute doctors’, claims Dr. Mohamed. “We actually competed against each other while at work,” says Dr. Mohamed. For Dr. Heba, “We were competing but at the same time good friends. We used to help each other; sharing ideas, materials such as books,” she says. All over the Cairo military hospital where the two worked, everyone was mentioning two names; Mohamed and Heba. But how did such nature drive the two to becoming wife and husband? In the interview, Dr. Heba was quick to take over this question with a lot of excitement. “One day when we were working in a night shift. Then he came to me and said; ‘I am thinking of getting married’. I said that is a good decision but asked him if he had a partner. He instead turned to me and asked if I had one for him,” Dr. Heba reminisces. In her response, Dr. Heba assured him that she would link him to a ‘beautiful pharmacist’ that would make a good wife. In a funny response, Dr. Mohamed rejected Dr. Heba’s services saying she could be trying to connect him to an ‘ugly’ woman who has failed to get a man and wanted her in his hands! But before the story ended, Dr. Heba revealed to her workmate and friend that the girl was her sister. “We did not proceed. We stopped there,” Dr. Heba said. It was about 3am when the two were working in a night shift from different hospitals when Dr. Mohamed grabbed his phone and called Dr. Heba. “It was a normal call as we had always done,” says Dr. Heba. But again, something came up. According to Dr. Heba, “He called and said I think we can make something together. I think we can be husband and wife,” she says with a big smile. A few days later, the two indeed became husband and wife. Dr. Heba who studied at Ain Shams University in Egypt says that unlike her husband who never dreamed of becoming a doctor, this was her dream since childhood. “My dad was a doctor and this had been my dream. My mother was a teacher but I never had interest of becoming a teacher,” she says. Since the two are gynecologists, Dr. Mohamed follows up his wife throughout labour until delivery. “He is my gynaecologist,” Dr. Heba said. Dr. Mohamed remembers almost every patient he attends to. But in Rwanda, he will never forget a pregnant mother he attended to for the first time when he arrived at University Central Hospital of Kigali (CHUK). “It was a Saturday morning and was end of the year. She was bleeding profusely after delivery and had been transferred from the district hospital. I successfully operated on her and she went back home,” he told KT Press. The other element that keeps Dr. Mohamed memorizing patients is ‘having special cases’. “For example, I meet pregnant women who have lost their babies so many times. When I help them deliver their first baby, I feel honoured. Such a person cannot go out of your mind,” he told KT Press. Planning to build own Hospital? “Owning a hospital is something big and requires so many doctors. Our passion now is to make sure we provide the best quality of service at any hospital in this country,” says Dr. Mohamed who works with her wife at Legacy Clinic in the outskirts of Kigali. The two gynecologists believe that the health sector has overwhelmingly improved in Rwanda – given the growing number of doctors and specialists the country has produced so far. They told KT Press both have developed love for Rwanda and would wish to become naturalised citizens. “We have already bought land and hope to acquire Rwandan citizenship soon,” said Dr. Mohamed. The couple lives in Kagugu, Gasabo district in the capital Kigali. Despite dedicating their lives to save pregnant mothers, Dr. Mohamed and his wife do not just stop there. 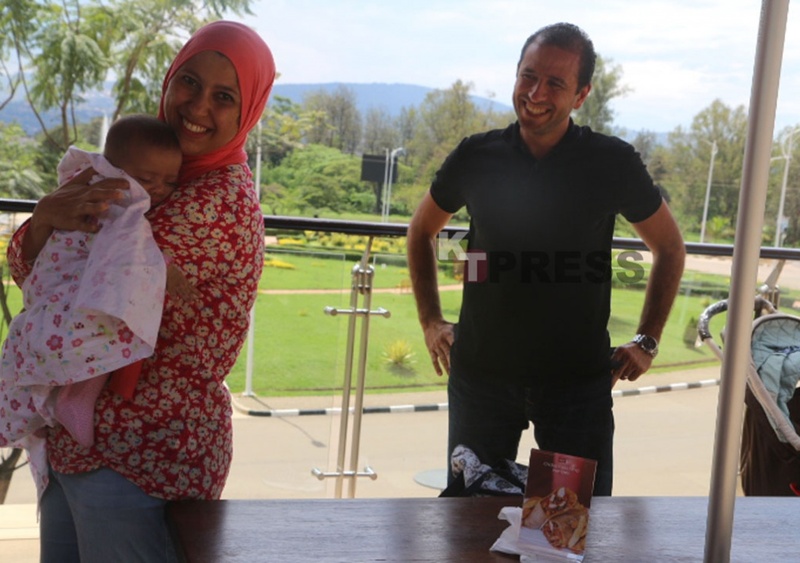 They, like other income earners, thought about a different venture – ‘just to earn us a side income’ Dr. Mohamed told KT Press of their famous ‘Cleopatra bar and Restaurant’ located in the upscale Kimihurura neighborhood. Waouh!! Interesting story!! Thank u doctors. U’re really doing a great job in our country. We love both of u!! Wooooou am speechless about the two for sure these two are not doctors just by profession but they are good hearted we wish to have you guys as citizens of Rwanda thanks for being their for us. After almost 40 weeks of disturbing pregnancy, my wife delivered twin beautiful girls with the help of Dr. Heba. six months later, our family sent a portrait of Dr Heba with my wife and the twins to Dr heba written “the blessed hand of Dr. Hebat” and I added “thank You” in recognition of the wonders they are doing( with husband Mohamed) …These angels (Heba and Mohamed) must have been sent from up above to save mothers and unborn babies in this country. Their level of professionalism, sense of duty and love for their patients is unprecedented. I have never seen a Dr (a wife to a husband moreover ) You call past midnight and they respond without hesitation!! God bless Mohamed and Heba. May they sooner than later become Rwandan citizens. I’ve never seen a doctor so passionate about what he does like Dr. Mohamed! The couple has been a blessing to many Rwandan mother’s through the passion and dedication to what they do. Let Rwanda reward your kid and your own conscience! I wonder how a very busy couple to even see their kids, will have time to manage a restaurant/bar…. Soemthing doesn’t add up..!! Dr Mohamed is the best, he picks up his personal phones calls and actually remember his patients. He has been my doctor for the past 6years. I have also heard amazing things about his wife. May Allah bless them as they bless the women of Rwanda. I am Egyptian internist and tropical medicine specialist. I have been working in Saudi Arabia and i am interested to work and settled down in Rwanda.Who could help me to implement this wish.